You are currently browsing the tag archive for the ‘Monocle’ tag. A year or so ago, Monocle asked me for a brief piece on the proposed bullet train between Sao Paulo and Rio de Janeiro. I sent them a short article that clearly showed my scepticism over not just the timing of the link – it was originally supposed to be ready in time for the 2014 World Cup – but also its entire premise. Hindsight is a marvellous thing but so far I’ve been proven right, especially about the timing. More than two years after it was announced, work has still to start on what Brazil calls the TAV, or Trem de Alta Velocidade. The tender has been postponed twice and the country’s own courts have questioned how feasible the project is and whether it is environmentally sound. All this came back to me this morning when I read that China was about to open a high speed rail service between Shanghai and Beijing. The 1,318-km link cost $33.9 billion and took three years to build. That is almost three times the distance of the Rio and SP line at a cost of around 1.5 times what Brazil proposes to pay for its shorter version. Now, comparisons between Brazil and China are always unfair for obvious reasons. But this example nevertheless serves to illustrate why the gap between the two nations will continue to grow, as well as highlight why Brazil faces a credibility deficit. It’s not just that China says it will do things and then does them, in the stipulated time and at something resembling the proposed budget. More pertinent is Brazil’s own promises and expectations. It promises the earth and then falls short. Or it ends up paying well over the odds when it realises it has overstretched itself. It happened with the Pan American Games in 2007, when it promised to construct 54 km of metro and built precisely nothing. It is happening with the World Cup, where it took two years to decide on the venues and then another year to start building. I’d also bet it will happen with the 2016 Olympics. Brazil’s bullet train might still come to fruition. But in a country with almost no passenger railways wouldn’t it be easier to build an ordinary, and much cheaper, rail system between the major cities? It’s never smart to try and run before you can walk. Monocle are shifting their attention to São Paulo. Nine months after the magazine wrote a special section about Rio de Janeiro, two writers came to South America’s biggest city to anchor a similar section. I’ve written a few stories for the Monocolumn from São Paulo, this about the floods that besieged the city in January and this about the city’s expanding metro system. And I got involved with the special section last week, writing reviews on the best bars and restaurants, suggesting top shops and hot chefs and reviewing some of the most important businesses in the city. The format will be similar to that of the Rio section and I am covering much of the same topics. Choosing restaurants was made easier because I’d done a similar thing last year for the Wall Street Journal. I hung out with Veja’s Restauranteur of the Year Paulo Barroso de Barros, the chef and owner at Due Cuochi, and we visited his 10 favourite restaurants (see my blog here with links to the Journal piece). I am also writing about Embraer, which I’ve covered a few times recently for the Financial Times, including this piece for their Aerospace report. And of course, this being Brazil, there’s an obligatory piece about football, which is always easy, and a pleasure, to cover. The section is scheduled to come out in a couple of months. The World Cup Logo. Again. Monocle published my latest piece about the World Cup logo today. I quite liked it when it came out, although I thought it a bit simple, as I said in this post back when it was revealed. But wth his designers eye, Leite pointed out how the design was poorly done and out of proportion. Leite compared this design to a not dissimilar one for the World Basketball Championships (pictured right). The Copa2014 web site has launched a competition to find an alternative but no one should hold their breath. Just like London, which created a horrific logo for the 2012 games, local organisers won’t back down. Love it or hate it, we better get used to the World Cup logo. When I first came to Brazil back in 1999 it still wasn’t too dangerous to walk into most favelas unannounced. For years I gave weekly chess lessons to kids in the Cidade de Deus favela, made famous in the film City of God. It was hairy at times – once we were forced to spend an hour flat out on the floor as a gun battle raged outside – but after a few months I became known and the locals (i.e. the traffickers who controlled the place) let me in with no hassles. In Rio, slowly but surely, things are getting better with the UPPs and favelas are becoming more and more like regular communities. One of the reasons is the overall rise in living standards. Companies are realising the people there have money and are opening businesses. It’s easy to imagine that favelas are just poverty but most people there have televisions, CD players, fridges and even washing machines, according to recent data. Now, companies like McDonalds, Bobs, Deplá, Casas Bahia and other multinationals are opening branches in favelas or poor communities to take advantage of that general rise in well-being. Since President Lula took office in 2003, some 24 million Brazilians have been sprung from absolute poverty and 31 million have progressed into the middle class, according to the government’s own figures. The Spanish bank is one of several firms looking to the future. The Complexo de Alemão branch is small, but it is a seed. The people I spoke with at Santander were quite clear. This is a test. 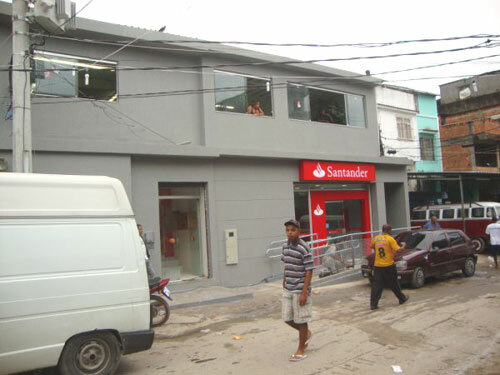 If it goes well, more favelas will have their own banks. Brazil’s preparations for the 2014 World Cup are going to be a source of stories in the years to come. It’s not just that billions will be spent on stadiums and infrastructure (or not), it’s the overall story of how Brazil will change. Brazil’s president in the 1950s Juscelino Kubitschek was famous for his massive modernisation program that was dubbed 50 years in 5. What is happening now has the potential to transform Brazil almost as quickly. But as usual, the politicians and administrators are more worried about their own popularity/egos/10 percent (delete as applicable) than actually transforming cities and providing citizens with the arenas, transport and infrastructure their tax reais are paying for. More than 30 months have passed since Brazil was the unanimous choice to host the 2014 tournament but it has done next to nothing to prepare. Nary a foundation has been dug or a brick laid. Experts believe the delays are not unintentional. If clubs or public authorities wait until the last minute, the federal government will be forced to step in with funds to save the nation’s blushes. That way everyone gets a new stadium and the public pays for it. “The cold hard numbers indicate that in the medium and long terms the Morumbi’s receipts are going to fall. 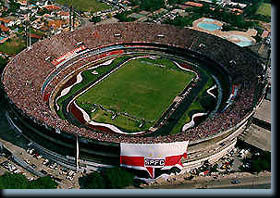 When it was constructed it was the city’s main stadium. All the big games were played there. That is no longer the case. Corinthians stopped playing there for many reasons, including political reason, so São Paulo’s income has dropped drastically. It has shows but you can only have 5 or 6 shows a year at most. Palmeiras will build a stadium with private money and they are going to factor in shows and so that market for shows is going to shrink. If SP does 5 or 6 shows a year now then they’ll be doing 2 or 3 in years to come because that market will be divided. “São Paulo know this but they didn’t want to go to the BNDES and ask for the government financing because they know they will adversely affect the club’s finances for many years to come. Even though the loan is at a low rate of interest it is to be paid over 12 years to pay and they’ll be committing themselves for years to come. The shocking thing is not just that it’s a strategy that has a great chance of success. It’s that everyone know it. It’s a chronicle of an abuse foretold. A new stage of the SP metro opens next week and the city is celebrating. About 3.6km of track will open between the main Avenue Paulista and Faria Lima, a busy commercial street. It’s a important moment because it links two of the city’s key areas. It’s important enough that I wrote this story about it in Monocle magazine. It also marks the first stage in the modernisation of SP transport system, a process that is long overdue. SP has only about 60 km of metro and light railways, less than much smaller cities such as Osaka, St Petersburg or Madrid. Last week I interviewed José Luiz Portella, the state secretary of metropolitan transport, and he assured me that São Paulo would have 420 km of integrated metro and light railway by 2014, the year Brazil hosts the World Cup. I have my doubts. Public works projects in Brazil take forever. They’ve been building a metro station near my house for two years now and it’s not scheduled to be ready for another four years. Two years after being chosen to host the World Cup they’ve still to start work on any of the stadiums. What the hell takes them so long? It’s an unfair comparison but Shanghai has added 190 km in the last six years and Beijing isn’t far behind. No one seriously expects São Paulo to match that kind of pace because unlike China it is a democracy with a functioning, if slow, justice system. But the city is grinding to a halt because of traffic congestion and it isn’t moving nearly fast enough to solve the problems. It needs a larger and better public transport system and it needs it now. That means getting rail lines laid quicker. It means less corruption and more competition in the tender process. And it means construction companies have to bite the bullet and slash their margins. Most importantly, it means Brazilians need to pull together if they are serious about transforming their country into one that is truly modern and dynamic. Apparently the magazine Wallpaper has decamped to Brazil this month to write a special on the country. Some 17 reporters and editors are working from a provisional office in São Paulo, which will be the main focus of their June edition. Wallpaper, I think I am right in saying, was started by Tyler Brule, who then sold it and went on to found Monocle. It remains a style bible for people who like art, design, architecture and overpriced luxuries. I know all this because the editor Tony Chambers was interviewed in the Folha de São Paulo newspaper the other day. Read the interview here in Portuguese. Now I know there’s a place for magazines like Wallpaper and Monocle and a lot of what they do is great. Monocle, I know, has done exceptionally well since its inception three years ago. But the way they glorify conspicuous consumption, especially in a country as unequal as Brazil, leaves me cold. Chambers probably never saw it but in the same day’s paper (or maybe the day before, I can’t remember) there was another comment on Brazil’s big spenders that summed them up their mentality. A study showed that car importers whack massive levies on their vehicles. Of the six examples given, the cheapest – a Volkswagen Touareg 3.6 V6 – sold for more than twice its US price. Others were going for almost four times their US value. The reason is greed. Or the “Brazil profit” as the study’s author is quoted as saying. In other words, car importers, the same as importers of mustard, jeans and furniture to name just a few, happily slap huge margins on the cars because they know there are plenty people with money who are willing to pay those ridiculous premiums in order to own a brand name. To me, it’s the definition of having more money than sense. And I don’t find it admirable. Just daft. Or pathetic. Monocle’s Rio special came out and as promised, here is the list of the city’s best bars. Monocle printed 10 but one (or more) of my erstwhile colleagues who parachuted into Rio to help write the report snuck Bar Lagoa on there (they erroneously called it Bar da Lagoa but that’s not what is important). Bar Lagoa has lime green walls and the main cuisine is German. The waiters are notorious for being rude and the front looks onto the busy road running round the lagoon. It’s not Top 10 material, and is certainly not better than the Jobi, to my mind the best boteco in the city. Academia de Cachaca is also a long way from being a great bar. It does have a wide range of cachaças, something that few bars bother to have, but it’s essentially a few tables and chairs laid out at the entrance to a grotty shopping mall. It’s not pretty and the service leaves much to be desired. The others are all great. Here they are, with why I think they deserve a place on the list. As I’ve talked about in previous posts, I’ve been doing a lot for Monocle magazine recently. My latest piece is here for their Monocolumn, the magazine’s daily postcard from somewhere in the world. I wrote on São Paulo and the almost biblical rains that have pounded the city over the last few months. The statistics tell their own story. The second half of 2009 was the rainiest six-month period in the city’s history. The months of January and December were second and third on the rainiest month list, drowned out only by December 1947. Rainfall in December was 77 % above the monthly average; rainfall in January was 87 % above the norm. It has rained in São Paulo on every one of the last 47 days. The reasons are both natural and man-made. El Niño has warmed waters in the Pacific, and warmer waters are also circulating on the Atlantic side of the country. That has increased humidity. Warm fronts of humid air from Amazonia are also a factor. And even more than most big cities, São Paulo is concretesville. It never ceases to amaze me how Brazilian architects have taken the greenest country on the planet and made it grey, Oscar Niemeyer being the biggest culprit among them (but more on that another time). 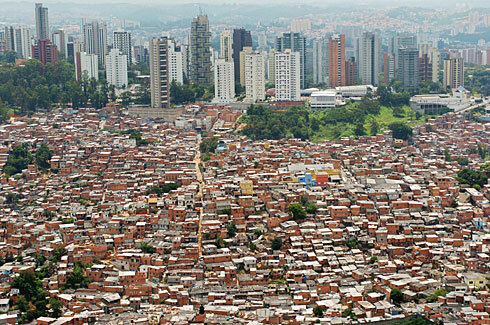 In São Paulo, there are few trees and fewer lawns. Plants can absorb up to 20 percent of rainfall, easing the burden on the drainage systems. In Sampa, the water falls on concrete and runs into drains that are often clogged and into rivers that can’t cope. Even the marginals Tietê and Pinheiros, the vast rivers turned fetid canals that split great swathes of the city have burst their banks, flooding railways and roads and leaving commuters stranded. My story concentrates on Jardim Romano, a poor neighbourhood in the far north of the city, parts of which have been under water for two months. These brilliant photos from the Estado de São Paulo newspaper blog are worth many thousands of words. Twenty years ago I was working in a factory in Scotland. If you’d told me then that I’d be getting paid to write a magazine article about the best bars in Rio de Janeiro – let alone suggest that I’d know any bars in Rio de Janeiro! – I’d have said you were mental. But that was one of my tasks this week for Monocle’s special section on Rio. A few clarifications before we go any further. First of all, in addition to writing about bars, I have the not quite so enviable task of writing about the economy, hedge funds and transportation infrastructure. It’s not all glamourous nights out. And second, writing about bars is not a way to secure endless free drinks and favours from Brazilian publicans. I’ve been doing this mostly on my own dollar (or real), visiting bars I would like to include. I check them out, usually with friends, to see if they are serious candidates for a Top Ten list. The ones that are good and where we are treated well have every chance of going on the list. The rest don’t. Of course, I have a pretty good idea where is good and where isn’t because I lived in Rio for eight years (and drank in my fair share of bars and botecos). Even since I left for São Paulo two years ago I’ve come back almost every month. And I’ve plenty of Carioca friends who are suggesting new places I didn’t know about. Yet chosing any ‘Best of’ list is totally subjective. One man’s great bar is another man’s dump. See Bar Lagoa for the classic example. Why so many people think this outstandingly ordinary boteco is so great I will never know. But the same could be said for Bar Urca, which I like. It’s so small there is no room for tables. Patrons take their drinks and cross the road to sit on the wall overlooking Botafogo Bay. Is Bar Urca a great bar? Maybe not. Is it typically Carioca? Arguably, yes. Would it give visitors to Rio a new prespective on the city and afford them a new experience. Definitely. That’s why Bar Urca is on the short list and Bar Lagoa isn’t.